Dear Z-Way/RaZberry users, we are proud to announce a new release! In v2.3.1 we were focused on stability issues, Expert UI usability and fixed a lot of small and big bugs. As usually, we keep full backward compatibiliy with previous releases, so you are safe to update. After upgrading to 2.3.1 i'm now getting an error in Expert UI ! 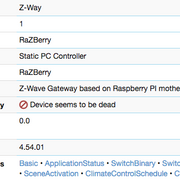 Interview page 'Wireless Activity' says "Device seems to be dead"
HUGE thanks for the effort. I can report that the locks are now showing their proper status. Many thanks ! PoltoS wrote: Dear Z-Way/RaZberry users, we are proud to announce a new release! AND every day a crash ! Thanks ! no problems with 2.3.1 with 2 small installations, thanks for the work. But is it possible to get back the old colour style in Expert UI, Neighbours? What can be wrong and how to fix it ? In that case why do you need RaZberry to talk to itself?